Hunting ranch north of the Rio Grande River in South Texas. In and around the Missouri River Breaks and the Milk River, Eastern Montana. Ranch is nestled against the Colorado River in the Texas Hill Country and offers an abundance of wildlife. Camping, lodging, and guides available. Dude ranch offers accommodations in lodge and cabins, and meals. Includes rates, schedule, activities, and contact information. Specializing in rifle and bow hunts for trophy deer, elk and antelope in and around the Missouri River Breaks and the Milk River. Includes prices, photos, and details of accommodations. Located in Glasgow. A working cattle ranch experience. Branding, driving, and shipping cattle along with fishing, pack trips, river rafting and Narrow Gauge Train rides. Western-style dude ranch with a campground on the French Broad River in Del Rio. Offers horseback riding and other outdoor activities. Adventure river trips on the Pigeon River in the Smoky Mountains. Includes river and trip information, location, safety and mailing list. Wilderness hunts in Northern British Columbia. Guided hunts for pheasant, quail and chukar. River Outfitter that offers one day river trips and multi-river packages. Offers river trips in rafting, kayaking and hydrospeed. Based in Veneto on Brenta River and in Valle dAosta on Dora Baltea River, Italy. Rates, scorecard, pro shop, and directions. Aspen. Whitewater river rafting, kayaking, and fishing adventures on the Rogue and Illinois Rivers in Oregon, and Middle Fork of the Salmon River in Idaho. Offers lodging, river education, and travel information. Guest ranch on the St-Francois River in the Appalachian foothills offers trail riding. Photos. Located in the heart of Wyomings highest and most rugged mountain range, the Wind River Mountains. Includes sales list, photos, and profiles of horses. Located in Sherman Oaks. Wimberley, Texas summer camp for girls ages 7 to 16. Includes activities, facilities, and location. Offering both native and exotic game. Pricing, FAQ and contact information available. Located in Branford, Florida. Nations largest ranch under one fence. Features ranch store and information on their cattle and horses. Roswell, NM, ranch offering family ranch vacations tailored to each guests level. Cattle ranch offering F1 Bradfords and ranch paint and quarter horses for sale. A Texas summer camp for girls ages 7 to 16, womens retreats, and reunions offering recreation and relaxation. An 18-hole, par 62 course located in Saint Marys River Valley near Cranbrook. Offers basic course information, map, rates and bookings. Breeding horses with performance bloodlines. Site offers photos and pedigrees of standing stallions and broodmares. Hand-crafting Pinot Noir and Chardonnay in the heart of the Russian River Valley. American sporthorses for show jumping, dressage, eventing and field hunting. Santa Ynez, California. Cattle and horse ranch near Guthrie, Texas in King County. Ranch information. List of stallions at stud. If the business hours of All Our Pets in may vary on holidays like Valentine’s Day, Washington’s Birthday, St. Patrick’s Day, Easter, Easter eve and Mother’s day. We display standard opening hours and price ranges in our profile site. We recommend to check out allourpets.com for further information. 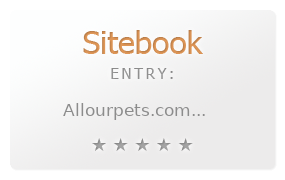 You can also search for Alternatives for allourpets.com on our Review Site Sitebook.org All trademarks are the property of their respective owners. If we should delete this entry, please send us a short E-Mail.